Twisting cobbled streets with an eclectic collection of individual shops are teamed with some of the country’s top attractions, including Alnwick Castle dubbed the Windsor of the North, Alnwick Castle was the location for Hogwart’s in the Harry Potter films. Home of the Percy family and Dukes of Northumberland since 1309, alongside is the Duchess of Northumberland’s marvellous creation – The Alnwick Garden. Dine among the treetops in the Treehouse Restaurant – a fairytale setting, in one of the world’s largest tree houses, or enjoy afternoon tea with a pot of Earl Grey tea in the amazing tea room at Howick Hall and Arboretum, where Earl Grey tea originates from. Whether it’s rifling through the shelves of Barter Books; one of the UK’s largest second hand bookshops housed in the town’s old railway station, or catching a performance at Alnwick Playhouse, toe-tapping to live music in a lively local Inn or exploring the Bailiffgate Museum which brings to life the people and places of Northumberland, there’s always something to do in Alnwick. One thing is for sure; a magical time awaits you in this spellbinding town. Alnwick Castle looms over the town and is the home of the Percy family, the Duke of Northumberland & the world famous Alnwick Garden. It dominates the west of Alnwick above the river Aln. The castle is home to commerce, education & tourism – It currently provides an education centre for American students studying in Europe; is the HQ of Northumberland Estates and is a tourist attraction in its own right. Open from April to October (the Gardens all year round), it is the second biggest inhabited castle in England after Windsor Castle. The castle is popular with TV & film-makers, with Blackadder, Robin Hood, Prince of Thieves, Elizabeth and even Downton Abbey all having filmed here. 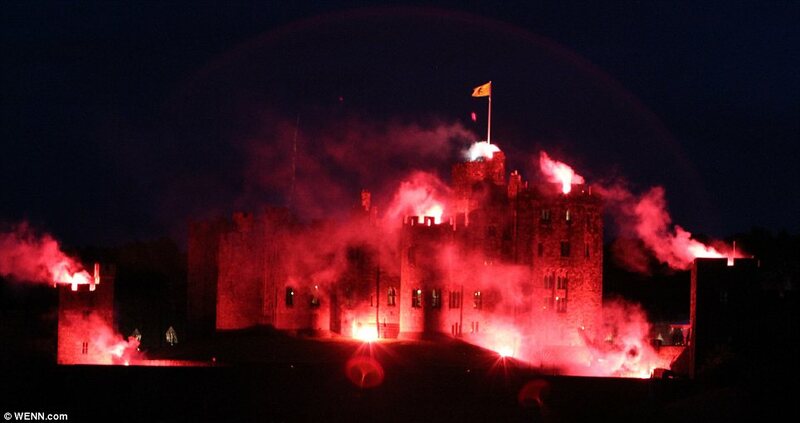 Most famously, Alnwick Castle found fame as Hogwart’s School of Witchcraft and Wizardry in the Harry Potter films. All during the season, the castle hosts some fantastic events for children including broomstick training and Dragon Quest, including seasons events for Halloween too. If you buy tickets for the castle and garden together, there is a discount. Visit the website HERE and read more about the Castle and Gardens on our website by clicking HERE. The Treehouse is not only a world of wobbly rope bridges and wooden walkways, but it is a treetop restaurant too. Always featuring local fish and seafood, meats from Northumberland’s farmlands and other regional specialities, the Treehouse Restaurant menus highlight local quality, taste and change throughout the seasons. There’s a great wine list, a good range of beers and regular live music. This special venue is open all year round for both lunch and dinner, but it is recommended that you book in advance with it being such a popular tourist venue. Click HERE to read more about the Gardens and Treehouse on our website. Situated next to the castle, ‘The Alnwick Garden’ has been given a new lease of life and restored into one of the world’s most extraordinary gardens. From poisonous plants and treetop walkways to glorious roses and towering delphiniums, the Duchess of Northumberland’s vision for a forgotten plot is now a truly 21st century experience full of imagination and fun, all brought to life with water. Visit the spectacular Cascade fountains, the Poison Garden, the Ornamental Garden, the Serpent Garden and the famous Treehouse to explore what’s on offer. Many of our cottages in Alnwick are within easy walking distance of the myriad of restaurants, pubs and cafes spread across this historic town. Most of us have eaten at all of the places below, so if you would like a personal recommendation, just ask. If you want something really special, then this is the perfect place. Dine in the biggest Treehouse in Europe with a huge open plan fire and trees growing through the floor, it is not one to be missed. The decor is beautiful, with unique carved furniture and twinkling fairy lights all around. Booking is absolutely essential as people travel for miles to dine here. The menu is very local and extremely good. Located within the grounds of Alnwick Castle and Gardens. Tel: 01665 511852 or click HERE for their website. Located just before you reach the archway into the main street of Alnwick, this rustic Italian caffé is bustling with atmosphere. You cannot reserve a table here but even if the restaurant looks full don’t despair, as the turnover of tables is quite rapid. If there is a queue they may suggest for you to go to the pub next door and they will call you when your table is ready for you. Tel: 01665 605455 or click here for their Facebook page. The Caffé is open 7 days per week during the summer season but closed Mondays during autumn and winter. Located just before you drive through the arch into Alnwick, The Plough is a relaxing but modern bar downstairs with a lovely, intimate restaurant upstairs, serving delicious food with a friendly atmosphere. The service is very good and they use local produce. Tel: 01665 602395 or click HERE for the website. A unique blend of authentic, contemporary Indian cuisine served in a stylish manner while still keeping that ‘home cooked’ taste and flavour. This is a ‘bring your own’ restaurant and an English Café during the day. Tel: 01665 606947 or click here for their website. Situated within the small pub, The Market Tavern, on Fenkle Street, don’t be perturbed by the ‘pub’ appearance to the front. The Tavern restaurant is situated at the back of the pub and the food is fantastic. A fairly new addition to Alnwick, the steakhouse serves excellent food in a romantic, low-light atmosphere with lots of choices of locally sourced meats and fish. Booking in advance is highly recommended as the restaurant is very popular with the locals too. Tel: 01665 602759 or click HERE to visit their website. Originally ‘Ye Old Cross Inn’ pub, it was nicknamed by the locals as, “The Dirty Bottles”, as the windows were full of old bottles that hadn’t been touched in hundreds of years. The current restaurant and bar has kept up tradition by adopting the local name and keeping the original bottles encased in the glass window! Now a taproom and smokehouse, they serve great cocktails, home-smoked meats and you can even order from your own table iPad and pull your own pints, The Dirty Bottles is as much novelty as it is good food. Tel: 01665 606193 or click HERE to visit their website. Serving Thai food with a menu created by their Thai chef in an informal café setting, the food is as fresh as it can get and the menu is a lot more authentic than most Thai restaurants you find in the bigger towns and cities. Usually open Wednesdays to Sundays, but call or check their Facebook page to check as this can vary depending upon the time of year. Booking is recommended. Tel: 01665 606332 or click HERE for their Facebook page. Situated just inside Bondgate Within, Yan’s is a modern style restaurant with an excellent Cantonese menu. Yan’s is always full with locals and tourists alike as their takeaway menu is as good as the restaurant menu. Booking ahead is recommended at any time of the year as it’s very popular and the reviews are incredibly good. They also offer a takeaway menu but don’t offer a delivery service. Tel: 01665 603888 or click here for their Facebook page. Even though Alnwick is a town, there are a number of lovely country walks from your doorstep and within a short drive you can reach the dramatically beautiful coast where you can walk for miles admiring the land and seascapes, and inland to the Cheviot Hills – fantastic walking country! Originally devised Parkland by Capability Brown himself, Hulne Park is the gorgeous land that surrounds Alnwick Cstle. There are various walks throughout the park and all paths are clearly marked. Some of the routes go through the Hulne Priory and the Alnwick Abbey Gatehouse. Access for dogs is limited throughout the park as many of the paths cross farmland and the Northumberland Estate has a duty of care to protect the livestock for the local farmers. The route for different walks can be downloaded online on the Northumberland Estate’s website by clicking here. This trail takes you from the edge of Alnwick to as far as Lesbury and around the pretty banks of the Coquet River. On this train, there are 2 walking routes and 1 cycle route. The first walking route is 3.8 miles long and partly follows the river. The second route is longer, stretching for 6.6 miles, which goes to Lesbury, around the pretty riverbank and back, allowing for a stop at The Coach Inn for a swift one! The cycle route goes further towards Alnmouth and is an easy route of 6.6 miles there and back. Click HERE to download the route from Northumberland Estates. If you fancy a driving day around our county, click HERE to find out the best routes and where to explore. Once of our personal favourite’s is the drive up to Kielder from Alnwick and around Kielder Forest. Alternatively if you wanted to head north, the drive along the coastline up to Edinburgh is beautiful, passing Berwick-upon-Tweed and some pretty villages on the way. There are some great shops in Alnwick for you to have a wander around, both high street and boutique. There are 2 supermarkets in Alnwick – Sainsburys and Morrisons, as well as local butchers, bakeries and green grocers. There is a Costa Coffee, a Boots, a WHSmith among other nationally recognised stores. As well as in the main street there is a small retail park with the Sainsburys, a Homebase and an Argos, as well as the leisure centre – The Willowburn Sports Centre – and a fuel station. A visit to Barter Books in Alnwick is a must if you have any interest at all in books. It’s the biggest second-hand bookshop in the UK and is housed in the former railway station in Alnwick – which is fascinating in its own right. You could easily spend hours there browsing their enormous collection of second-hand books, DVD’s, videos, etc. and they have a really interesting Antiquarian Section. There is a separate children’s department, where children are encouraged to read and play. They have also recently open the Station Buffet, which is a quaint cafe located in the old waiting rooms of the station building. In the wintertime, they have a roaring fire in each room – perfect for enjoying a hot drink and reading through an interesting book. 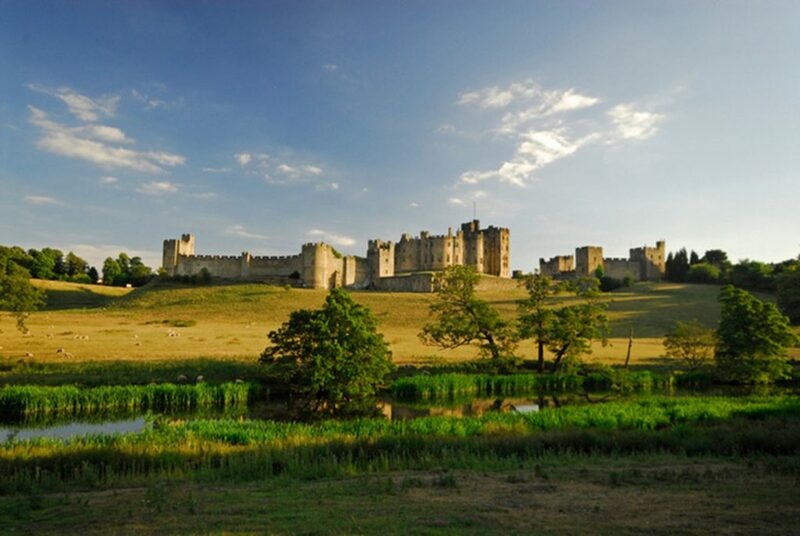 It’s located on the left just as you enter Alnwick from the south – you can’t miss the sign. A celebration of Northumbrian produce, drink and healthy eating in Alnwick. The food festival takes place in the market square, where you can buy everything from artisan bread to smoked kippers, as well as there being lots of ‘street food’ to buy and eat straight away and gifts to take home with you. The drinks festival is in the town hall, accessed from the market square. This established event is a huge attraction for the town, so if you are a foodie and fancy taking home some goodies with you, don’t miss out! Usually happens on the 3rd weekend of September annually. Alnmouth is just 4 miles south along the coast from Alnwick. At the end of June each year, there is a big arts festival spread throughout the whole of Alnmouth, lasting a couple of days over the weekend. There is an arts trail you can follow which takes you in and around the village through the little streets and up narrow alleyways, to find little stalls filled with local artwork. It is a huge hit with the locals and tourists every year and is definitely not one to be missed. Click HERE for the website. Located in the Alnwick rugby club just next to the Willowburn Sports Centre, there is a spectacularly large firework display on either November 5th or the nearest Saturday, beginning at 6:30pm. There is a small admission charge. A great local event if you are holidaying in the area at this time. Originally held by the De Vesci family for several centuries at the dawn of the second millennium, Alnwick Northumberland was handed on to the house of Percy in 1309. The Percy’s are still seated in the castle at the centre of the town. A picturesque market town, it was voted by Country Life in 2002 as “the best place to live in Great Britain”. With a population of around 7,000 it is located 32 miles south of the Scottish border & 5 miles inland from the North Sea at Alnmouth. It dates back to approximately 600AD and despite much of the town being razed to the ground in 1424 by Scottish invaders, over the centuries it has thrived as an agricultural town, the location of Alnwick Castle and home of the Earls of Northumberland and as a stopping place on the Great North Road between Edinburgh & London. Despite its recent growth it still has much of its original character. Most recently it has become a modern rural communter town. Alnwick also boasts one of the biggest second hand book stores in Europe; Barter Books, housed within the old railway station. The main east-coast railway line is situated around 4 miles along the river Aln and can be accessed via Alnmouth railway station. The town once had its own rail link, but this ceased in ’68 because of the terminal nature of the line and the lack of opportunity for it to be developed. The building itself is incredibly ornate, which is due to the station’s frequent use by royals visiting the Percy’s at Alnwick Castle. Barter Books is now its main resident and much of the grandeur of the station is visible from within the store, which is a wonderful place to stop off and browse over a cup of coffee in front of their roaring fire. picture postcard streets such as Fenkle Street, Pottergate and Narrowgate surround the marketplace, many of which are cobbled, and all of which are lined by charismatic period buildings. Historically, Alnwick was surrounded by a defensive wall to stave off attacks from invaders, but this wall has since been almost completely demolished, and only one of the majestic gatehouses survive. Hotspur tower, as it is known, was built at the turn of the second millennium and derives its name from the 2nd Earl of Northumberland, known as Harry Hotspur, who lived in Warkworth Castle. Another fine building in the town centre is the gothic Pottergate Tower which is now a fabulous holiday property which you can book directly with Coquet Cottages. See full details here. This is a beautiful ornate gatehouse which was built in the eighteenth century on the site of the original gate. It once had an elegant spire, but this proved to be quite delicate and was destroyed a short time after it was built by a storm. The Playhouse is an all-purpose arts centre, which contains a theatre, a cinema and a gallery. The weekly newspaper is the Northumberland Gazette which covers the town and the district & their head office is in the town. Alnwick has numerous opportunites for leisure & sports which include the new Willowburn leisure centre, football, rugby and cricket clubs. Because of the nature of the area there are also opportunities for rock climbing, walking, water sports, horse riding, cycling & there are also dozens of golf courses in the area, including some links courses on the coast. Brizlee tower is just one of the dozens of other dedicated buildings across the town. It sits on a ridge in Hulne Park and acts as a beacon which would be lit whenever anything of note happened so that the people of the town could be made aware. The White Swan Hotel contains the lounge and fittings from the RMS Olympic which was identical to the RMS Titanic and the RMS Gigantic (in the same fleet). Both were broken up after the sinking of the Titanic in 1912 for fears of a flaw in either the design or build. The Northumberland Fusiliers museum is located within Alnwick Castle. The Percy Tenantry Column was erected to thank the 2nd Duke of Northumberland for giving them a rent reduction during a time of particular hardship for farmers. This column has the Percy lion at its very top – the emblem of the Percy family and is a striking landmark at the southern entry to the town. We know all of our cottages and Northumberland inside out, so if you have any particular queries, please don’t hesitate to call or email us. We’re more than happy to help!